The data scientist role is an offshoot of the statistician role that includes the use of advanced analytics technologies, including machine learning and predictive modeling, to provide insights beyond statistical analysis. The demand for data science skills has grown significantly in recent years as companies look to glean useful information from the voluminous amounts of structured, unstructured and semi-structured data that a large enterprise produces and collects — collectively referred to as big data. A data scientist uses large amounts of data to develop hypotheses, make inferences and hone in on customer, business and market trends. The data scientist must be able to communicate how to use analytics data to drive business decisions that may include changing course, improving a process or product, or creating new services or products. This is a complete course that provides you detailed understanding of data science, encompasses basic statistical concepts to advanced analytics and predictive modeling techniques, along with project life cycle, data acquisition, analysis, statistical methods and machine learning. The objective of the course is to learning statistical analysis techniques and tools to solve business problems that help you to emerge as ‘Industry Ready’ professional in the field of Data Science. You will be learning the Data Science skills with the most popular and leading analytical tools widely used across industries such as R.
Master key facets of data investigation, including data wrangling, cleaning, sampling, management, exploratory analysis, regression and classification, prediction, and data communication. Implement foundational concepts of data computation, such as data structure, algorithms, parallel computing, simulation, and analysis. Leverage your knowledge of key subject areas, such as statistical quality control, exponential smoothing, seasonally adjusted trend analysis, or data visualization. Graduates / Professionals from various quantitative backgrounds like Engineering, Finance, Mathematics, Statistics, Business Management who aspires to spearhead their career in Data Analytics. Our trainers are highly qualified industry experts and certified instructors with more than 10 years of global analytical experience. Prior knowledge in basic programming / statistics is recommended for this course. 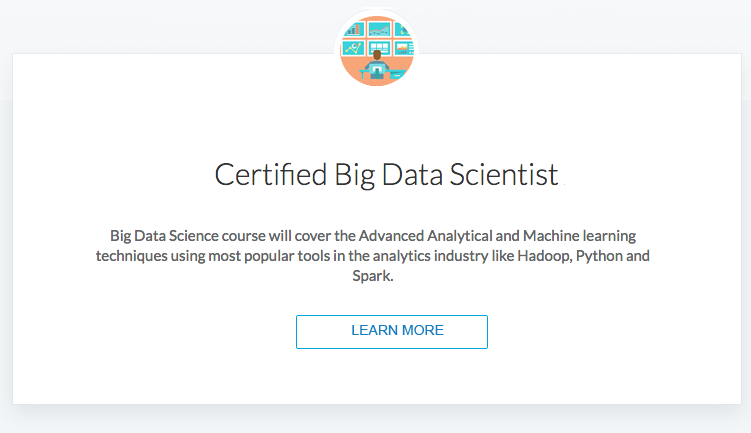 What do past students say about the Certified Data Scientist course? I have gained valuable experience and knowledge from the R-Programming classes. I liked the delivery of the training. Mr. Sunit was very helpful and made the course easier to follow even for a beginner. He can answer every question asked and even provided us with examples that we can easily relate to. Looking forward to other courses. Firstly, I’m satisfied with the content structure and the pace of the R for Data Science class. Mr. Sunit Prasad managed to present the course contents in an organised and interesting manner. He made sure to assess and build the foundation of the students in R programming before proceeding to teach us about the commonly used statistical analysis in the data science industry. Overall, this 5-day R for Data Science course met my expectations and I’m looking forward to completing the remainder of the Certified Data Scientist course. I have enjoyed the Certified Data Scientist Program that Databyte has offered and am confident that it will help me in up-skilling and increase my employability as I continue to do some self-learning and enhancements. In order to be “Certified” as part of the course, students need to complete the assignments and examination. Once all your assignments are submitted and evaluated, the certificate shall be awarded. The field of data analysis, as the name implies, analyses data to discover trends. It has tremendous uses not only in the economics and financial sector but fields like law, healthcare, public administration, politics, telecom, social media, manufacturing, banking & financial institutions etc. who rely on quality data analysis to arrive at strategic business decisions. Working professionals can definitely improve their resume and their job prospects by achieving a certificate in data analytics. 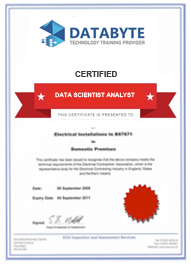 Model Diagnostics – Residual Analysis– Decile Analysis – ROC Curves etc..
Our Certified Data Scientist Program is exhaustive and this certificate is proof that you have taken a big leap in mastering the domain. The knowledge and skills you’ve gained working on projects, simulations, case studies will set you ahead of competition. Talk about it on Linkedin, Twitter, Facebook, boost your resume or frame it – tell your friends and colleagues about it.